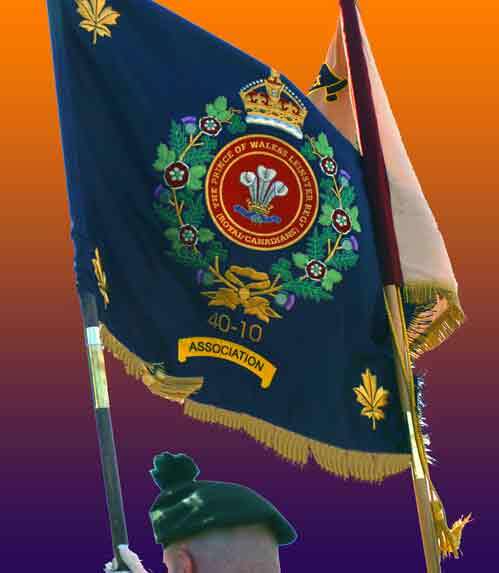 September 2006 The Leinster Regiment Association colours fly on the Somme battlefield! You can see photographs and video clips of the ceremonies in the Photo and Video gallery. 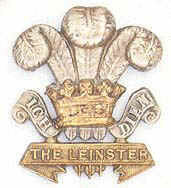 Following the 2nd and 7th Leinsters' gallant contribution during the Battle of the Somme, the narrative of the Leinsters' in France may well be seen, by some historians, to have closed on a dismal note when the last time the Leinster Colours were flown in France was the disbanding of 6th Battalion at Abancourt on August 10th 1918. Imagine, if you will, the honour bestowed upon the Regimental Association when Mayor Didier Samain of Guillemont invited the Association to parade the Leinster Colours as part of the ninety-year commemoration of the relief of Guillemont by the 16th Irish Division. On September 9th 2006, descendents of the Leinster soldiers who attended this commemoration were filled with emotion as the Regiment's Colours flew once more across this historic battlefield. Note: During the Great War of 1914 -18, the 2nd & 7th Leinster Battalions were combined in March 1918 after the German offensive broke through the British lines and the British 5th Army suffered its reverse in fortunes. The reformed 2nd Battalion (from 2nd & 7th Leinsters and part of 6th Connaught Rangers) , then moved to Belgium as part of the 16th Irish Division .